In this day and age, it is absolutely essential to protect your computer from virus. With the credit card information being exchanged online, the important data on your hard drive, the confidential emails in your account, as well as personal data that you would like to preserve, a virus is literally a messiah of doom. 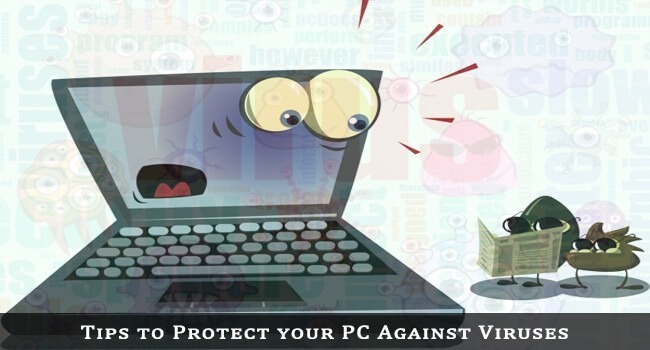 How to Protect Your Computer from Virus, follow the tips mentioned below. 1. Install an antivirus software: Make sure you have at least one trustworthy antivirus software installed. You can choose from free software available online, or purchase one. Make sure that you check out the reviews, and ensure that the software has not expired. 2. Use your anti-virus software: Just installing one won’t do. Configure it so that it scans your system regularly on its own. Also, enable automatic update option so that newer versions are installed on your system. This will ensure protection against newly discovered viruses. 3. Be smart when surfing online: If an email seems fake (like the one offering you a million dollars) or a link seems fraudulent, do not click on it. If it involves a transaction, double check by contacting the concerned authorities. Enable “https – secure browsing” on as many sites as possible. If your anti-virus software warns you about a website, do not open it. 4. Scan any external media before accessing it: Never open a USB Drive, external hard drive, or even a DVD before running an anti-virus scan over it. Most of the times, viruses are transferred through such media. 5.Download security updates for your operating system: Every operating system releases security updates regularly. Make sure you download and install them. 6. Never exchange passwords online: Even if it is with your best friend, never exchange a password, or any confidential information via email, or a messenger. If absolutely necessary, communicate it over the phone. 7. Scan the content that you download: You can never be sure that the file you just downloaded contains a virus or not. So scan your downloads before you use them. These are the tips How to Protect Your Computer from Virus and protect your computer from malware.